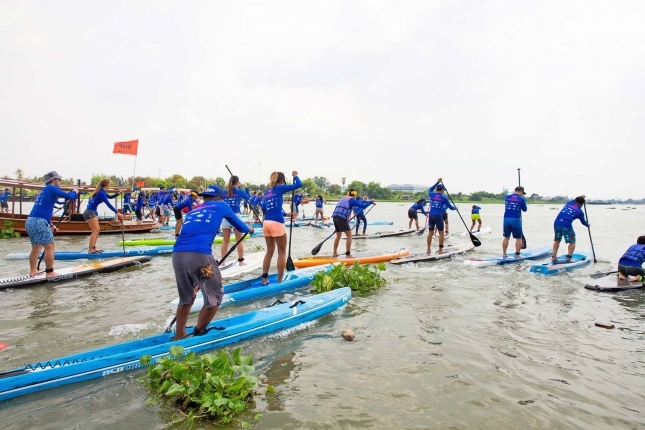 Bangkok hosted a landmark event last week, with the inaugural Chaophraya SUP Station Challenge showcasing the sport in Thailand’s capital for the first time, kickstarting SUP racing in a region that has all the potential to become a paddleboarding hotspot. 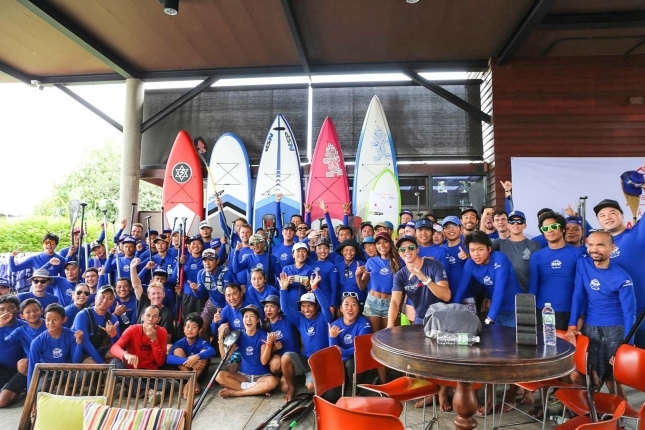 With strong support from international powerhouse brands Starboard and NSP, both of which are headquartered literally just around the corner, the event attracted close to a hundred paddlers including dozens of first timers. 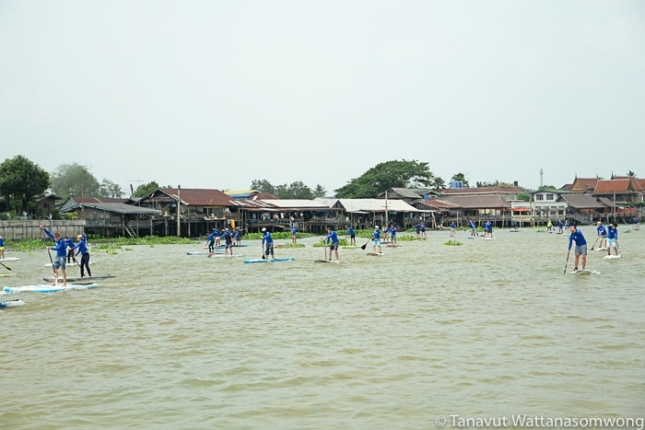 The race was hosted by the SUP Station, which is Thailand’s first dedicated paddleboarding club, along with top-ranked athletes Bruno and Daniel Hasulyo aka the SUP Broz. 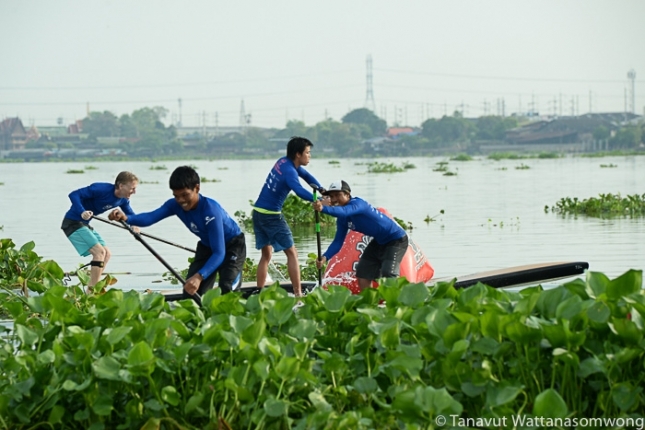 I caught up with the crew when I was in Bangkok, including Daniel and SUP Station founder Paul Bunyaratavej, to hear the full story behind this pioneering event. 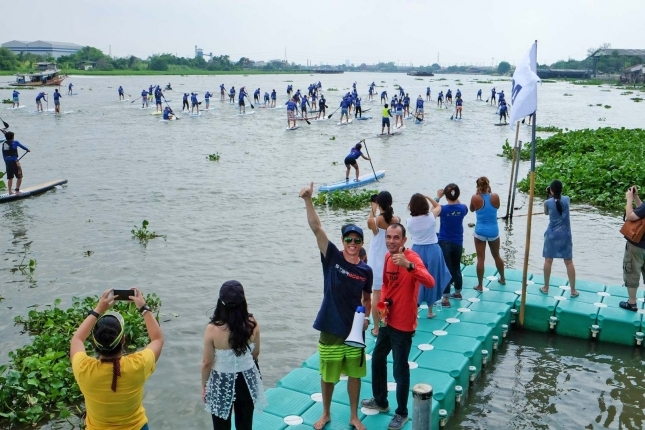 From chatting with the guys, it sounds like the big story wasn’t who won the race (Starboard manager Dan Gavere was in town and took out the 6km course), it was who participated in the race: most of the competitors had never paddled before, and almost none of them owned a board. Unlike most races, where paddlers show up with boards strapped to the roof of their car and everyone knows exactly what they’re in for, most of the 81 participants in Bangkok descended on the event site with nothing more than a pair of boardshorts and a big dose of enthusiasm, forcing organisers to do a last-minute round up of every loose piece of equipment they could find so that everyone would have a board and paddle. 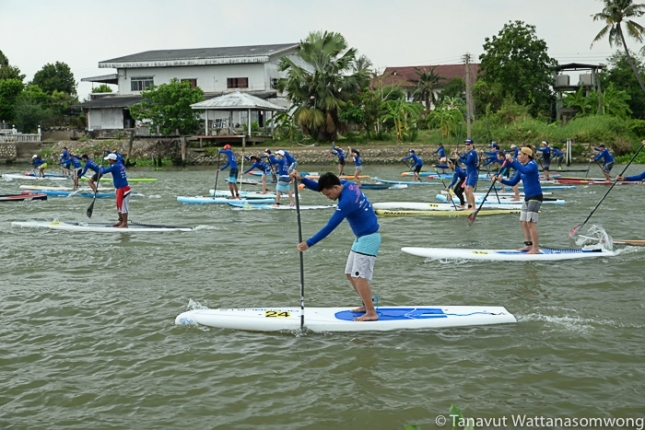 If one of the main aims of any event is to help grow the sport, then the inaugural Chaophraya SUP Station Challenge was a wild success (the name ‘Chao Phraya’ refers to Thailand’s biggest river and the home of the SUP Station). But despite the lack of experience in the field, the event was run smoothly and everyone completed the course, which at times was rather challenging. 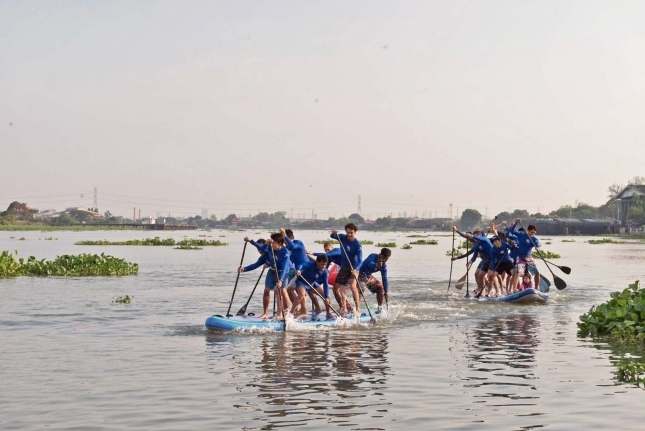 There was a late, wild thunderstorm that made life difficult for some of the back-markers, while a few obstacles including a massive river barge created a tactical challenge for the race leaders. 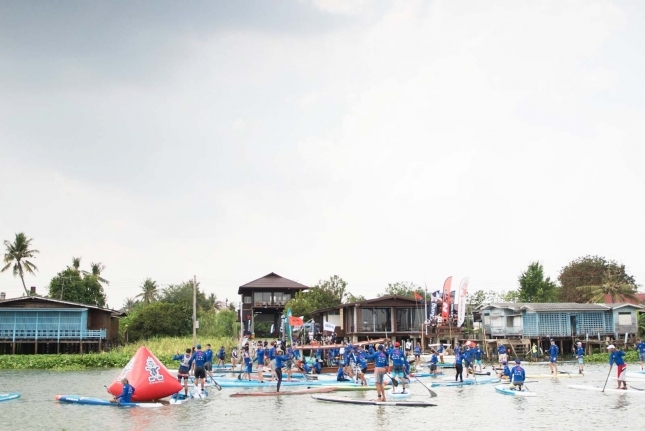 In addition to Starboard, NSP and the SUP Broz, the event was also backed by the massive ThaiBev drinks conglomerate as well as Rip Curl Thailand. 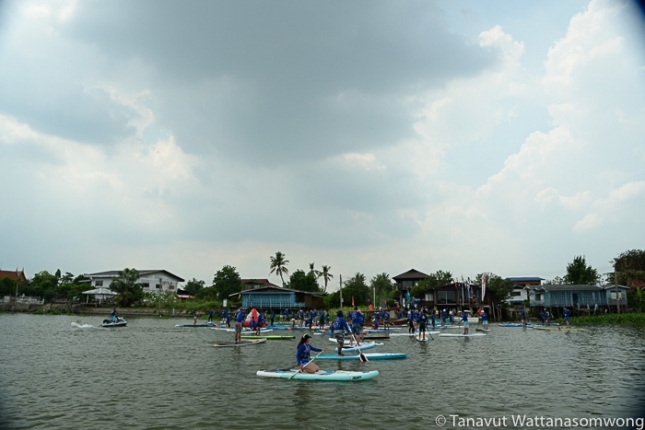 The event was also well supported by the Thailand Rowing & Canoe Federation, which sent several of their athletes to compete standing up for the first time. 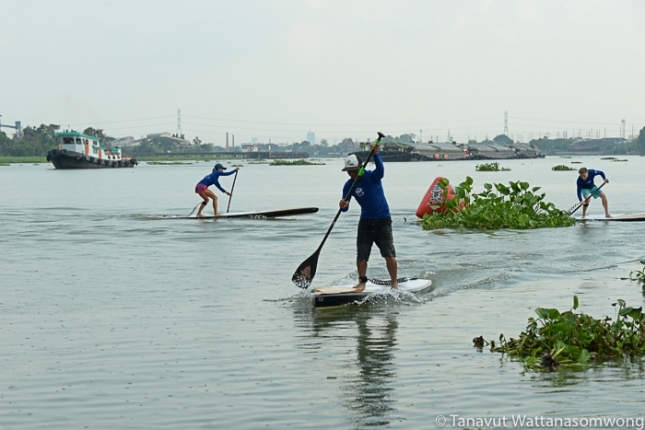 Apart from the 6km grind, there was a 3km race along with sprints and a Starboard Starship big SUP novelty showdown that was won by an enthusiastic national canoe-kayak squad, while it seems pretty much everyone that got on the water got off it with a smile. 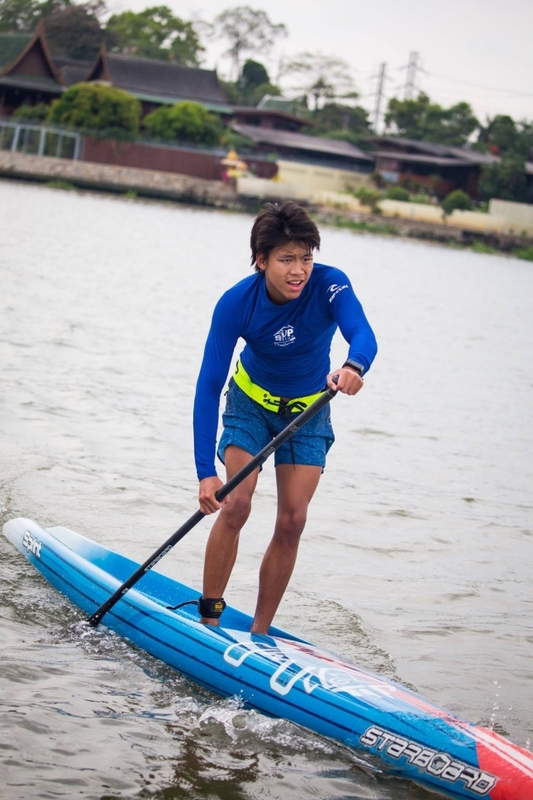 The Challenge also created Thailand’s first national ranking, with the long-term goal of developing a squad that will eventually compete at the ISA Worlds (perhaps as early as this year in Denmark). Thailand has never competed at the World Championship in the past. 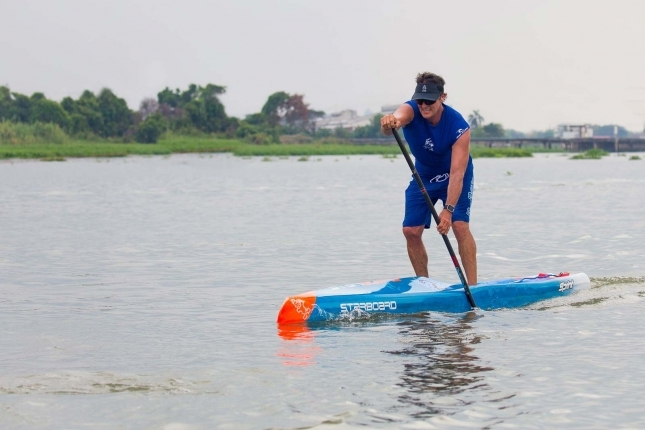 When I chatted with Daniel he was still on a high of excitement from the event, suggesting that not only would Thailand produce a large SUP community in the next five years, but that South-East Asia in general could be the next key growth area for the sport. 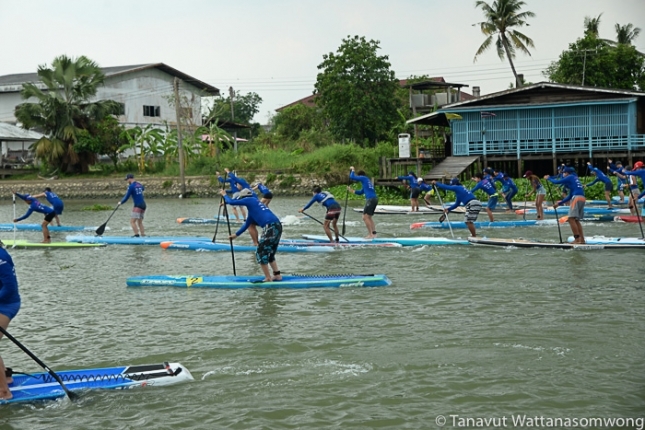 The potential is definitely there for Thailand to become something of a SUP destination. 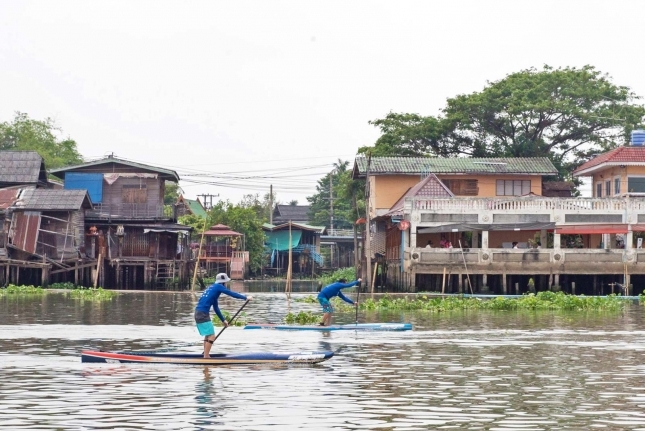 Apart from being home to some of the most beautiful paddling locations on the planet, Thailand has always been an important part of the SUP ecosystem. 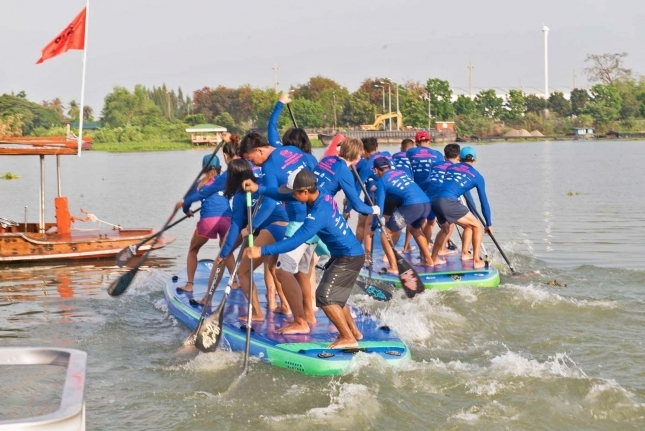 The nation is home to several international brands in addition to Starboard and NSP, though at the core is the ‘Cobra’ megafactory just south of Bangkok, which pumps out more race boards for more brands than any other facility in the world. If you’ve paddled a few different brands in your time then chances a very good you’ve been on a board that was made in Thailand. Time will tell if racing takes off in the country, but this event looks like a pretty big step forward. 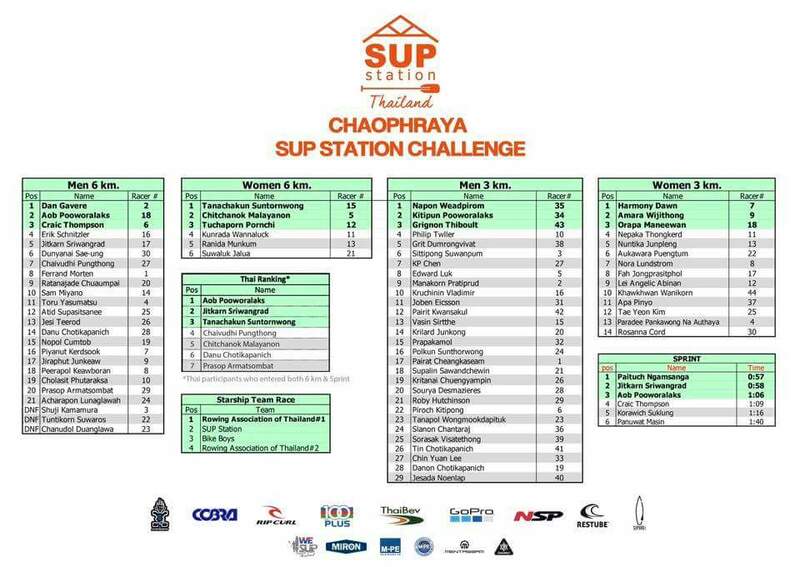 So congrats to the SUP Station and SUP Broz for pulling off what sounds like a great race. 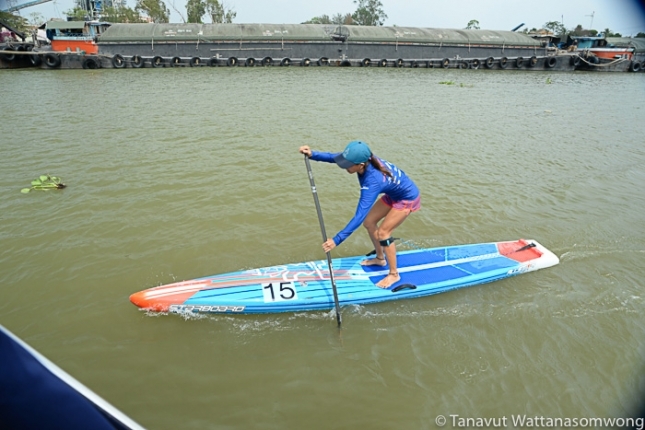 I’m looking forward to seeing where this event, as well as Thai paddleboarding in general, goes from here (and next year I’ll try and sort out my ferry schedules a little better).